36. 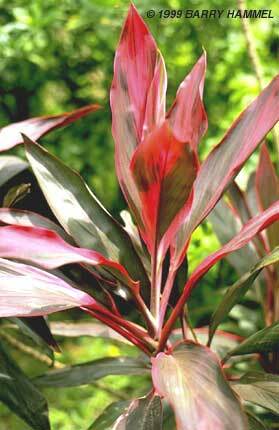 Cordyline Commerson ex R. Brown, Prodr. 280. 1810. Plants treelike or shrubby. Stems ± woody, usually few branched, with conspicuous leaf scars distally. Leaves crowded at apex of stems, petiolate (or sessile); petiole 10--30 cm, base amplexicaul; leaf blade elliptic-lanceolate to sword-shaped, veins essentially parallel but with lateral veins branching from midvein in proximal 1/2. Inflorescence arising from axils of distal leaves, usually paniculate, large, many branched. Flowers bisexual, solitary, usually tubular-campanulate or subcylindric; pedicel usually short, articulate at or near apex. Perianth with short tube; lobes in 2 whorls of 3. Stamens 6, inserted in tube or throat of perianth; anthers versatile. Ovary 3-loculed; ovules 2 to many per locule. Style slender; stigma capitate, small. Fruit a capsule, leathery, 1- to several seeded. Seeds black, coated with phytomelanin. About 20 species: S and SE Asia, Australia, Pacific Islands, South America; one species (introduced) in China.